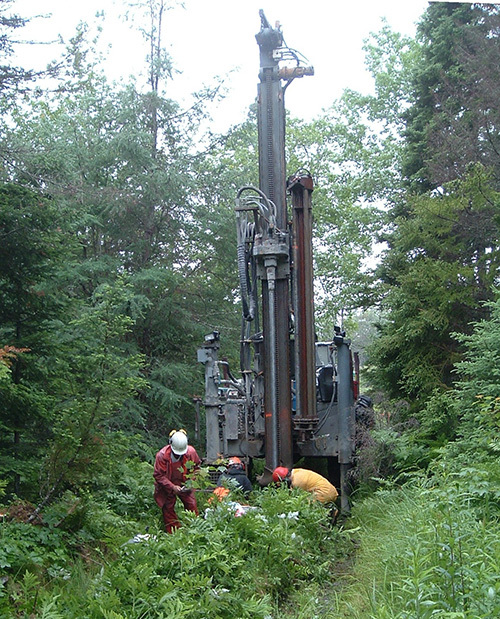 Drilling for samples to test for the subsurface presence of gold is an important step in the search for exploitable gold deposits. Workers on a drill rig collect soil and rock samples. Mining for gold in Nova Scotia today is a multi-year, highly-regulated process that weighs the benefits against the hazards to people and the environment. It involves several stages, such as prospecting, staking a claim, doing scientific studies of the gold deposit, opening and closing the mine, and reclaiming the site. Reclaiming usually means returning the property to nature or improving it for recreational use. Each step requires provincial government environmental review and sometimes scrutiny by the federal government. Unlike in the past, mining today cannot leave behind a legacy of hazards and desolate landscapes. Before they even break ground, companies must have approved reclamation plans and provide a large financial deposit to ensure they fulfill their obligations. Community concerns about mines are also a consideration. Industry, government and environmental organizations are working together to create guidelines for community consultation. There’s plenty of gold still in them thar hills! Despite the fact that gold has been mined in Nova Scotia since the mid-1800s, there is still ample gold left to be dug. Most of the mining done in the past only went to very shallow depths. Geologists believe that the gold deposits in Nova Scotia are a lot like those in Australia – and actually go down to depths of more than a kilometre. The price of gold remains high and Nova Scotia is poised for yet another gold rush.